Let’s go back in time again to pertinent facts that prominent people do not bother to mention in describing whether they are “pro-Common Core” or “anti-Common Core”. In the 80s, it turns out, most everyone that matters now had a common vision for the “reinvention” of public education and where and how it should be carried out that still controls the actual implementation today. Now it is firmly mandated by federal law that is far better understood with some of these old quotes taken from the the Educational Excellence Network created by the well-known Diana Ravitch and Chester Finn back in 1981. Public controversy over what was usually just thought to be Outcomes-Based Education threw off the full implementation in most places and the real purpose of the Common Core was to get everyone in K-12 education anywhere in the United States (actually the world, but this is a post not another book) on the same page as what was laid out first in the 80s. It appears to me that much of the anti-Common Core organized effort has been coordinated and financed by groups with ties to both the pro-Common Core effort as well as that Educational Excellence Network (EEN) and its vision. The Internet and the computer servers it accesses can be purged, but not all the old books that were written crowing about that new vision. Once the details are laid out, it has not been hard to get copies of enough verifying sources to prove the consistency of the vision to what federal law now requires and what is being pushed as School Choice on President-Elect Trump. Old books then are almost as good as HG Wells’ Time Machine so let’s consult them in earnest. California was the first state to roll out Curriculum Frameworks and it started with math and science with language arts (what we know as the infamous Whole Language) and history in the following year. Diana Ravitch was co-author of that California History-Social Science Framework while she also served as Director of EEN. Chester Finn left to be an Under Secretary of Ed under Bill Bennett between 1985-1988 (during Project Education Reform: Time for Results) . Here’s a short overview of the shift away from facts and towards what we now call in statutes “higher order thinking skills” and “challenging academic standards” in ESSA that must be assessed annually for ALL students. That’s the real reason academic tracking had to go away. The Wave Theory has nothing to do with the beach unfortunately and was a means to lay out the phases of state education reforms since 1983. The 1987 California PACE Study found that the needed change in teacher practices and support for the kind of “demanding curriculum” laid out above (Wave 3) needed a new conception of schools and how they would work (Wave 4). Wave 4 then is what now goes by the euphemism School Choice and it presupposes and is designed to accomplish that kind of wholesale transformation of school content and what is to now constitute knowledge. Here’s the money quote–“Wave IV involves a restructuring of school organization and resources to support fundamental changes in curriculum and instruction. The restructuring typically involves shared decision-making, site-based management, major curriculum reform and a renewed sense of teacher professionalism. But rather than seeing these reforms in isolation, Wave IV involves linking these reforms to changes in the schooling experience for students.” Being an Education Advocate, Insider, or a nominee for the Department of Education who claims to be “Anti-Common Core” and “Pro-School Choice” is to either be deliberately disingenuous or to fail to understand the factual history of these education reforms. A less convoluted way to say that would be to cultivate a Worldview to guide each student’s future perception and their interpretation of daily experiences. That is what curriculum reforms and learning standards now like the Common Core have in common with what California and the EEN pushed in the 80s with common financing of both EEN and School Choice, then and now. In his 1991 book We Must Take Charge, Chester Finn thanks both the Olin and Bradley Foundations for their support of EEN as well as special shout-outs to both Lamar Alexander and Bill Bennett. Since both of these men would also serve on the Education Policy Committee of EEN in the early 90s with so many others who are well-known School Choice advocates, before EEN closed up shop formally and rolled into the Fordham Institute in 1996, let’s look at that book. I will note first though EEN’s path. Columbia U, then Vanderbilt where Finn was an ed prof, then the Hudson Institute, and now Fordham. “Conservative’ is another adjective that is an oxymoron when applied to public policy think tanks engaged in advocacy for this transformational view of education. Let’s think of how useful it has been in obscuring this actual agenda to pretend it is conservative or locally-based. In a 1986 paper, “American Schools and the Future of Local Control,” that points out that School Choice will allow per student spending to no longer be tied to property taxes which vary community to community, Finn and his co-author Denis Doyle from yet another think tank, AEI, that likes to cloak its advocacy behind that ‘conservative’ oxymoron, admitted that School Choice was actually ‘radical’ and that local control was an “antiquated doctrine.” Not in today’s rhetoric when the School Choice lobby wants taxpayer money. In reality, it puts governments at every level in charge of all these areas, using education as a transformation process, for what each student must internalize as the basis and motivation for future action. It turns out that my old books made it crystal clear that ‘public policy’ is just a euphemism for governments assuming control instead of individuals themselves. Market-based public policy then is just another oxymoron cloaking who is now to be in charge and what they intend to do. 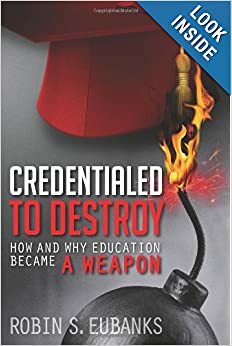 I wrote Credentialed to Destroy and then started this blog with its prescient title because I wanted to try to make the hidden, but provable, transformation visions visible in time. Transformation is just another euphemism for a revolution. This one is quite nonconsensual and intended to be invisible and permanent at a neurobiological level. I will close with another Finn/EEN quote that also explains why controlling Worldview is so important. Think of the anti-Common Core/School Choice coordinated manipulation as being about cloaking the reality below the treeline. That would also explain the Deceit and False Narratives surrounding Social and Emotional Learning Standards, wouldn’t it? This is the beginning of the factual stories behind K-12 educational reform over recent decades that I was saving until after the Presidential election, waiting to see who won. It was my feeling based on the false narratives being spread and the facts in my possession that both candidates would end up pushing the same K-12 education agenda for the most part. Hillary Clinton because she and Bill Clinton have been involved going back to Arkansas being one of the states that volunteered in the 80s for the little discussed, federally-sponsored (while Bill Bennett was Education Secretary and with Lamar Alexander when he was the Tennessee Governor and head of the National Governors Association) “Project Education Reform: Time for Results”. Donald Trump would be pushing the same agenda because his advisors on education hyping School Choice as the panacea do not seem to be telling him its history. So I will don my metaphorical helmet and flak jacket and begin doing it. For those not raised on Uncle Remus Tales in the South the briar patch in the title is from the “Brer Rabbit and the Tar Baby” story where the captured, but cunning rabbit, convinced his mortal enemy Brer Fox that no punishment could be as dreadful as being thrown into the briar patch. Being thrown in the briar patch was actually Brer Rabbit’s escape route. School Choice as it has been developed over the decades by think tanks and professors is actually a trap pretending to be a remedy so it can be put into place as a matter of law. Let’s move away from American folklore now that we have a metaphor for whether something will trap us or free us and move to a book published in 1990 called Politics, Markets, and America’s Schools by John E Chubb and Terry M. Moe. Both will later serve on an ed reform project sponsored by the Hoover Institution, the Koret Task Force, with one of President-Elect Trump’s ed advisors, Bill Evers, so he should be more than familiar with this history of School Choice, but the 1990 book was actually published by the Brookings Institution. Several fed ED grants funded the book along with the Olin and Bradley Foundations that have gone on to finance both School Choice initiatives and the experimental economics/Neuroeconomics work we covered in the last post. If this convergence of what is clearly a project of the admitted Left and purported Right seems confusing, let me quote from one of the book’s footnotes since I just love to tiptoe through the cited support. That again was Brookings and it fits with the Rockefeller Foundation’s recognition in the 80s that only “systemic school reform” would allow the kind of change in American schools toward holistic human development for ALL students that it sought. So School Choice became seen as the means for ensuring that ALL schools will offer “a high-quality learning experience” and a “rigorous curriculum in which students actively participate.” Envisioned as a theory in 1990 then, but that same pursuit of active and experiential is what accreditors now require and what the December 2015 Every Student Succeeds Act (ESSA) wrote into federal law for the states and districts to all implement. There is another useful confession in this book that no one seems willing to concede anymore now that School Choice is not just a theory. That same logic also is how homeschoolers are now poised to become ensnared via School Choice’s newest Vehicle for its Theory–Education Savings Accounts. Anyone using an ESA may be forced to submit to “high quality assessments” measuring and monitoring precisely what they have internalized and what guides their “sense of self”( as Reschool Colorado recently termed it in its Framework for the Future of Learning). Again, let’s go back to the beginning of the confessions about what Choice might do and who was involved. Now I am just getting started on what has poured out in the last month as I sought to discern why no one was being honest about the history of either School Choice or the Common Core’s ancestry and who has been involved. I guess we can just call this the Briar Patch Trilogy enlightening us all on why there has been such an insistence on false narratives. I have been warning that the law and education are viewed as the ways to alter culture and the prevailing individual consciousness to something deemed appropriate for the ‘cooperative commonwealth’–another term frequently used. If President-elect Trump is going to get us out of the Paris-climate accords (thank goodness! ), can we please also cancel the attendant cultivation of a Comrade Consciousness via education reforms?